There is a single Bouncer on guard outside the entrance, with two pit wolves in cages with leveled locks near him. 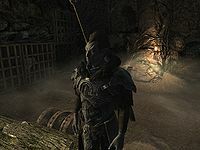 There is a campfire in front with a cooking pot hanging over it and two small one-man tents containing unowned bedrolls beside the fire separated by a food barrel and a couple of sacks. East of the fire is a tanning rack. 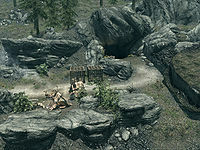 The entrance to the cavern is to the southwest of the campfire, with a crate and a couple of food sacks beside it. Be warned that the Butcher puts up a good fight and usually has an enchanted weapon. This could be a very long fight, so come prepared. 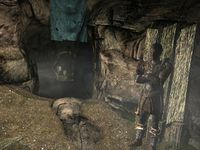 The first guard you meet inside Cragslane Cavern has no name, and cannot be pickpocketed or looted after he has been killed. This bug was introduced in Patch 1.9. This page was last modified on 14 April 2019, at 12:07.